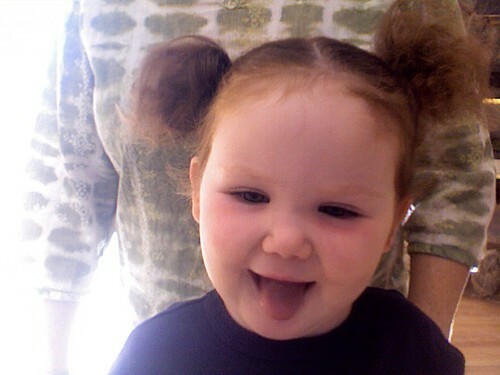 SQUIDALICIOUS: Mali: Look, She's Cute! She makes me laugh and gawk and wonder where she came from, mostly because she intuitively knows how things work in ways that this intuition-challenged parent never quite figured out. At Godmother Stacy's girls' birthday party, she picked up a birthday hat and put it on herself, with no fumbling. Then she took the paper off of a cupcake, methodically and cleanly, before eating it. I still can't do that without making a mess. She says Thank You and You're Welcome appropriately and spontaneously. This I truly appreciate. More gawking in wonderment: She and Iz are actually starting to bicker. Sibling bickering! Of the "Mommy! Izzy took my blanket and it's MY turn!" variety. Love it. Seymour's parents are coming to stay with us tomorrow. I just realized that, due to Iz's being on stage tomorrow night while Seymour works back stage, said in laws will be trapped in our house with just me, Mali, and Leelo for a few hours. And my mother-in-law is really really nervous around Leelo, whereas he is unpredictable around guests. I have been calling around for a babysitter, but no luck. Ah well. It's not a situation that can't be helped by little bit of my mother-in-law's beloved Chardonnay. And, hey! Though I slept with a barf bowl next to my bed last night, and despite my pipes gurgling ominously and loudly (according to Seymour) all night long, I did not succumb to this dual-ended splatterhose illness. I'm either very strong and healthy or extraordinarily fortunate.